Our graduate program is designed in a way that allows students to complete the Ph.D. within five to seven years. Students pursuing international field research or in other special circumstances sometimes need an additional year or two. During the first year of graduate study, our students usually take six courses, most of them required for the Ph.D. They typically select other courses in their areas of interest during this first year, too. If you have already earned an M.A. degree, you will probably pursue a slightly different program of study, depending upon your previous coursework. The following curricular timeline is a visual representation of course requirements. Please note that the Preparing Future Faculty certificate is not on the curricular timeline because it is not a program requirement. Circumstances sometimes call for extending coursework into the fourth year—if, for example, you are completing the Preparing Future Faculty certificate. 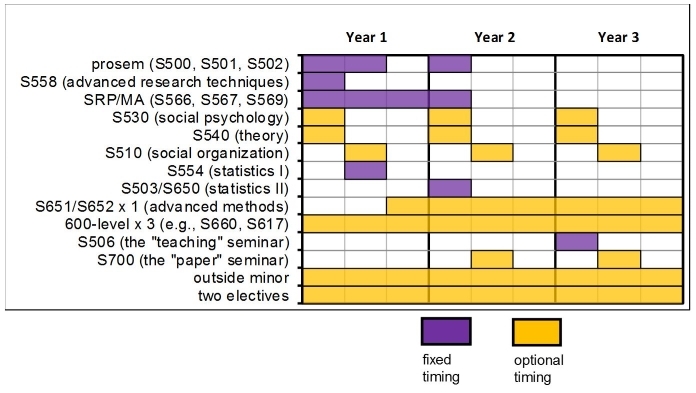 The timeline below depicts graduate program milestones, situating coursework into the complete set of Ph.D. requirements. It shows that not everyone moves lockstep through the program. There is a fair amount of flexibility in the timing of each milestone. However, the red zones indicate that this flexibility is not limitless. If you have trouble accessing the timelines, please contact our department.